Embroidered Patch. made with love by. 130mm x 75mm Approx'. Rayon - Artificial Silk - Stitching. HAS PREVIOUSLY HAD A BADGE FITTED WHICH HAS LEFT TWO SMALL HOLES. 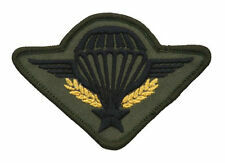 Official CLOTH wings worn by ELITE Para Trained personnel in the German Forces. GERMAN CLOTH PARA WINGS.